As the point person for customer questions at a bulk SMS service provider, TextMagic, I get questions every day from people who are new to the idea of texting their customers. What I love about doing this is that I get to share best practices for text messaging — and I’ve also learned the most common myths about SMS that are widespread among business owners. If you’ve been thinking about exploring this powerful channel for reaching your customers, you’re in the right place: here’s what you need to know before you get started. When you think of SMS for business, you might automatically assume that this refers to “promos.” Though texting is definitely used for promotions, often with notable success, I always recommend taking it a step further. Thinking outside the box and using this method for customer service will give your customers an enhanced experience of your brand. Text messaging is a fantastic channel for delivering status updates, appointment reminders, changes in delivery dates, and more. The truth is that over 75% of consumers with texting capabilities between the ages of 18 and 34 positively perceive companies that offer texting capabilities. It can provide added value, increase engagement, and actually grow customer loyalty. Read on to discover best practices for SMS marketing basics — and 3 inspiring examples. One of the reasons I see many business owners having doubts about text message marketing is that they think customers will find it intrusive. This is a myth. If you can provide exclusive value in your SMS campaign, write clear and personalized messages, use actionable CTAs (calls to action), and make sure not to spam your clients and customers, you will see awesome results. When executed properly, SMS marketing is very effective. Here are some great examples for inspiration. 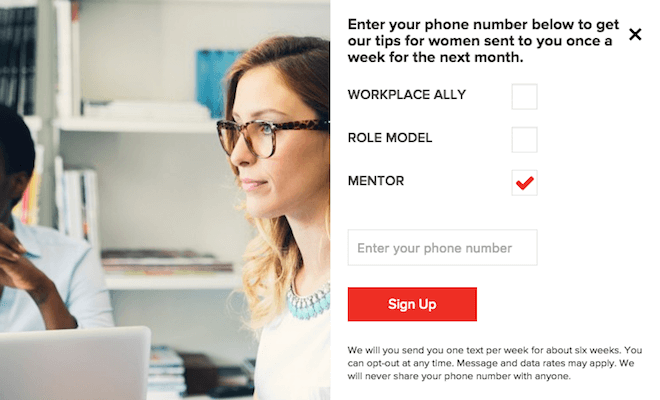 Leanin.org is using SMS to drive more female mentors to their program by offering tips for women who want to empower one another. The opt-in form for this particular campaign will segment new subscribers into three categories — workplace ally, role model, or mentor — based on which type of communications the recipient prefers. Segmentation is a great way to stay relevant with the messages you send. 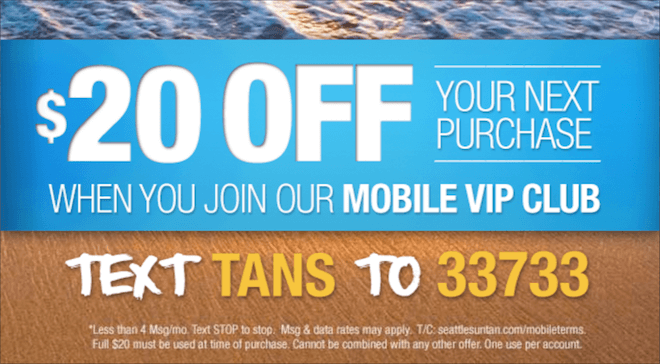 Seattlesuntan.com has an ongoing SMS campaign that offers subscribers $20 off their first purchase. They launched their business with this campaign and generated $200,000 in their first 30 days with no preexisting contacts. By the end of that first month, they had 4,774 new mobile subscribers, and a solid foundation of customers. The trick to this success was offering a high-value giveaway along with cross-channel promotion. $20 can make a substantial dent in the cost of tanning sessions or products. The risk, in this case, definitely paid off. The campaign was so successful that they decided to honor it as an ongoing promotion. Sonicdrivein.com provides an SMS option for customers who want to receive special offers and discounts for local dining. Providing text message recipients with coupons and specials is a fantastic way to get current customers to dine in more often. Similar approaches can be used to drive sales from contacts and leads for online and offline shopping. In many countries, including the United States, it is obligatory for the sender of any SMS campaign to receive the opt-in from the recipient in order to send marketing messages to them. Nonprofits, government branches, businesses – all must get the permission from their potential recipients. So if someone has not specifically opted in to receive mobile communications from you, leave them off your list. Even if you have already been emailing this person, and you already have their mobile number from a previous order, you still need to ask whether you may send texts to their phone. This is good for everyone. Some professionals still think that the larger the list, the more conversions they will get. That’s the old way of thinking. These days, you always want the person receiving your message to be happy about receiving it. People like to have a sense of control over all of their communications, be they mobile, web, or something else. By sending a “cold” SMS message, you’re in violation of both your customers’ personal space and the laws that protect consumers from this kind of behavior. You can find out more about the government’s communication guideline’s by reading up on the United States’ TCPA Omnibus Declaratory Ruling and Order, the UK’s Marketing and Advertising Laws, or investigating the regulations where you’re located. The penalty for being in violation of communication laws will vary by location. Burger King, Coca Cola, and GE are among the many recipients of multimillion dollar class-action lawsuits from various legal entities throughout the US for violating TCPA guidelines. This is the kind of road you could headed down if you don’t comply. When you’re establishing, building, and maintaining relationships with your customers, it’s crucial to be helpful and provide value. Relevance is the key to mobile conversions, anyway. The basics are pretty universal: just mandate opt-ins, keep your messages on point, and give recipients something to get excited about. Text message marketing works in real time. Your recipients will receive your message within a few seconds after you send them. They may have many messages coming in that there’s a good chance that yours will be dropped to the bottom of your reader’s list. Once there, it’s easily forgotten. Think carefully about when to send your messages — think about when you’d want to receive a text from a business (not too early in the morning or too late at night). You cna also be sure to include calls-to-action that maintain a sense of urgency. Use words like “now” and “today” and phrases like “this week only” to let your customers know that they have to act fast. Even if you love to plan ahead, remember that text messages are a unique form of communication that are all about spontenaiety. Send your messages just before your sale, event, or contest begins. If your customers receive texts a week before the targeted event starts, they will definitely forget what was written in those messages by the time the event rolls around. But don’t wait too long — if they receive messages too late, of course they’ll miss the promotion altogether. Time after time, I’ve witnessed the power of an effective SMS campaign. If you’re excited to get started, you can always check out a guide I put together: How To Write Effective SMS Messages for Marketing Campaigns. It will help you figure out how to take the initial steps to building out your first text messages…and tell you what you need to know about using (or not using!) abbreviations and all-caps. Soon you’ll be bringing a smile to your customers’ faces when they check their phones and see a wonderful offer or update there from your business. It’s a win-win for everyone! Alexa Lemzy is a customer support specialist and content manager at TextMagic. She loves to test innovative customer retention techniques and business growth tips. Alexa shares her advice on text messaging and customer service in her articles and tweets @Alexa_Lemzy.